If you are considering buying a diamond online, rather than in person, here is something to think about. 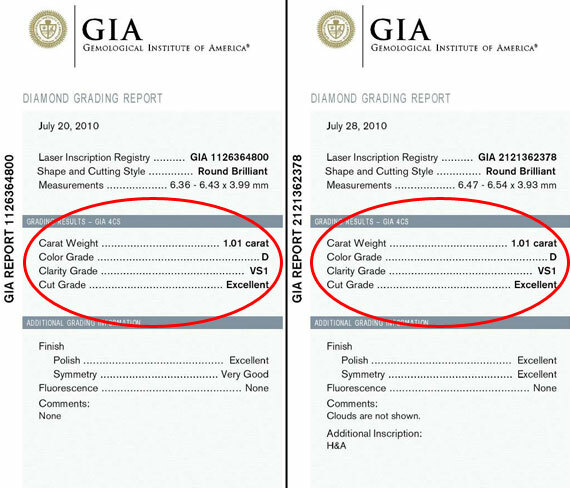 You may think these two diamonds will look exactly alike but, depending on the slight variations in proportions, they could have two different variations of brilliance. That is the potential risk you take when buying online, not actually getting your best value for your dollar. What you potentially buy online can only be best described by the salesperson, who may or may not actually be looking at the stone. To have the ability to view a diamond in person and to see how your eye perceives a diamond's fire and scintillation we feel, is priceless. Not everyone will have the same opinion, or quality of vision. We stock top quality, ideal cut diamonds that are tangible and breathtaking. We offer quality, selection, distinguished service, reasonable pricing, and the knowledge and tools to help you make the best informed decision. This is one of the most cherished moments of your life and we want to take the guess work out of the equation and make your purchase as carefree as possible.